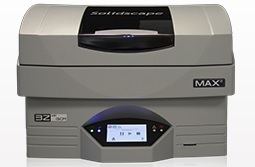 The high-precision Solidscape® MAX2 3D printer manufactures wax patterns. MAX2 supports higher throughput and delivers very significant production gains for precision designs in 3D printer jewelry, medical, and industrial manufacturing applications. The fully automated 3Z printers features a user-friendly touch screen and innovative 3D printer software that allows operators of any skill level to produce their own high-precision wax patterns ready for casting. Exclusive Solidscape 3Z® Model and 3Z® Support materials produce extremely smooth wax parts that accurately reproduce the most intricate of geometries while eliminating the need for manual post-production refining processes. Superior casting properties of these three dimensional printing machines include fast melt out, no ash or residue, and no thermal expansion. 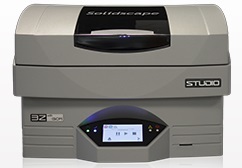 The 3Z Studio is suitablel for the low-volume custom retail jeweller, while the 3Z PRO and 3Z MAX2 offer higher print speeds and larger build envelope. The best way to learn and see the Solidscape machines is to attend our free seminar, "Introduction to RhinoGold Jewellery CAD and 3D Wax Printing"